We are delighted to announce that Brigid O’Malley has joined our Family team as a solicitor. Brigid’s new role will see her acting on behalf of clients seeking advice and assistance in relation to family matters including divorce, civil partnership dissolution, nullity, domestic abuse, financial proceedings and children proceedings. She will be working closely with Caroline Bilous – partner and head of the Family team. Brigid studied Law at Leeds Metropolitan University (now Leeds Beckett). She graduated in 2009, and completed her LPC at the College of Law in Chester in 2010 where she gained a distinction. Brigid qualified in October 2014 and has previously worked at Bell Lamb & Joynson and Makin Dixon Solicitors. 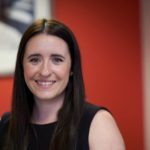 She has joined Davis Blank Furniss from WTB Solicitors. This entry was posted in Family & Relationships, News, People. Bookmark the permalink.